Sometimes a girl needs a little decadence in her life. 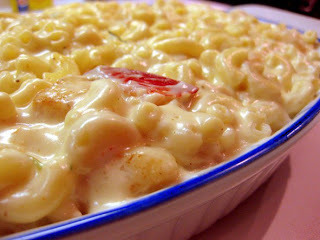 The other day I felt like spoiling myself with a cheesy, gooey mac n' cheese. But if I was going to indugle then I wanted to go all the way...Seafood mac n' cheese, baby! I added fresh lobster, shrimp and scallops. I wanted it to be creamy and dreamy so I added my own mascarpone cheese....lucscious. And to take it completely over the top I added some Truffle Dijon mustard...mmmmm. Now, this dish was a bit of work but I'm worth it. Oh yeah...this Dragon knows how to spoil herself. Enjoy! 1. 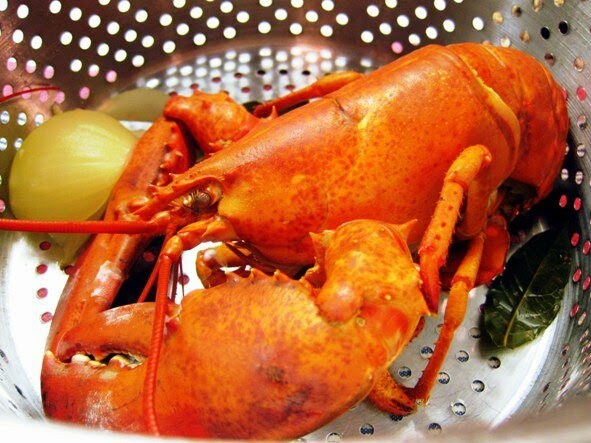 Fill a large pot with enough water to cover the lobster. 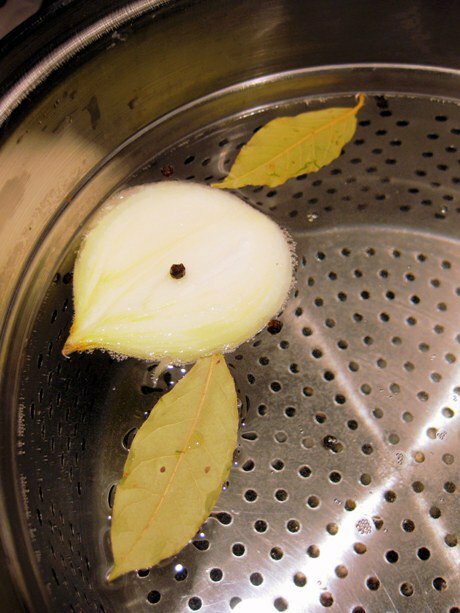 Add onion, peppercorns, salt & bay leaves and bring to a boil over high heat. 2. Kiss the lobster goodbye and put it head first into the boiling water. Cover the pot, reduce the heat to medium and cook 10-15 minutes. 4. 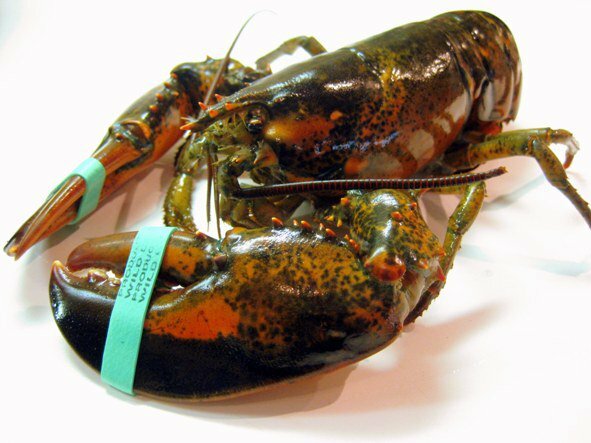 When the lobster has cooled enough to handle, remove the meat from the tail and claws and cut into chunks. 5. Heat a frying pan to medium high and add 1 tablespoon of butter. Sprinkle both sides of the scallops with the old bay seasoning and sear the scallops in the butter for 1 minute per side. This will give the scallops some colour but not completely cook them. 6. 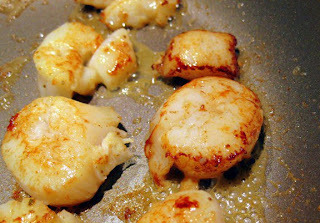 Remove the scallops from the frying pan and cut each of them into quarters. 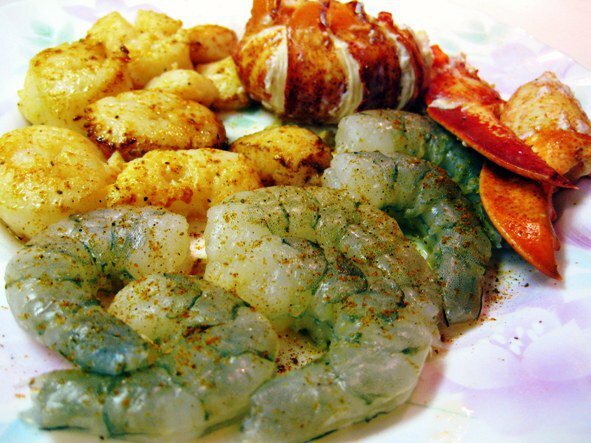 Set aside with the other seafood. 7. Add the lobster shells and shrimp shells back to the cooking water and bring to a boil. After it has come to the boil, remove all the shells and discard. 8 Preheat oven to 400F. Add the macaroni to the boiling lobster/shrimp water. 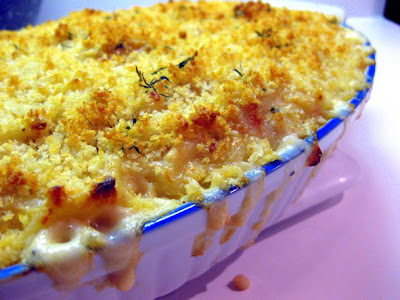 Cook the macaroni until it is almost al dente (remember it will cook more in the oven) or about 8 minutes. Drain and rinse with cold water. Set aside. 9. While the pasta is cooking, melt 1/4 cup of butter over medium heat in a large saucepan. 10. Add the onion & garlic to pan and cook until softened (3 to 5 minutes). 11. Add flour to the butter, onion & garlic and cook for 1 minute while stirring. 12. Add the milk and whisk until smooth. Bring to a boil then reduce to a simmer, and cook until sauce has thickened (2 to 3 minutes). 13. Add the nutmeg, old bay seasoning, Dijon mustard and herbs. 14. Remove the pan from heat. Stir in the cheeses and mix until smooth. Season with salt & pepper to taste. Fold in the cooked macaroni then gently fold in the seafood. 15. Transfer the pasta to a shallow baking dish big enough to hold the pasta. 16. To a frying pan over medium, add 1 tablespoon of butter. Add the panko & thyme leaves. Toss to coat the panko in the butter and toast slightly. Top pasta evenly with the panko mixture. 17. Place baking dish on a rimmed baking sheet. Bake until the topping is golden and sauce is bubbling, 15 to 20 minutes. Let cool 5 minutes before serving. Mmmm...I just had to wipe drool off my screen. This looks so delicious!!! 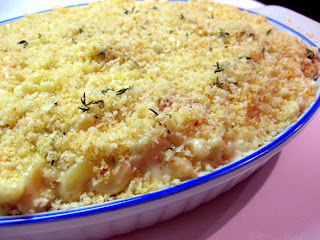 Real life testimonial: this lobster (with some seafood) Mac n. Cheese is the real deal...creamy and lots of seafood/lobster! One word and that's: WOW. :-) Great job! This dish just oozes deliciousness. Yes, it does look delicious and I’m sure I’ll love it, but the fact is I never cooked lobster or scallops before, because I don’t like the way they look. I mean they are delicious and all, but I don’t know how to prepare them. Anyway, your recipe is still mouth-watering and awesome. Thanks for sharing. Maybe I’ll try to prepare them on my own someday. I was looking at a recipe the other day to make a couer a la creme. The mascarpone and seafood takes takes mac and cheese to a whole new level! ooh wee! I'm not a huge mac n cheese fan but this here looks like i want to dig my whole mouth into! I love how it oozes off on the sides! nice work!